How I love blueberries! They are one of the chief delights of summer, a time when we can enjoy them fresh rather than frozen. Some years we've been able to go and pick our own. Most years I buy them on sale and freeze them in quart bags, ready to pop into muffins, pancakes, cobblers, and occasionally a blueberry pie (one of my very favorites!). Blueberry pancakes with real maple syrup and butter soaking in is a golden memory of childhood summers at Grandma's house. 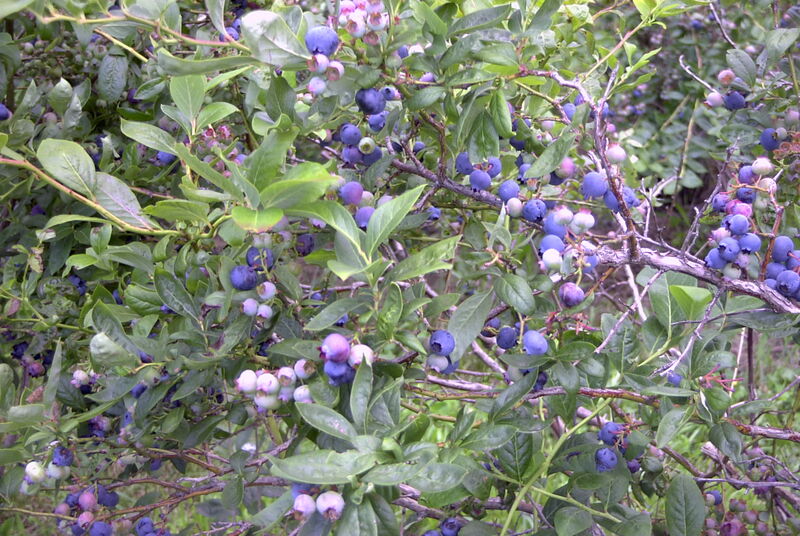 I do like to enjoy blueberries fresh: eaten straight from the bush, bucket, or plastic shell; dropped into a fruit salad with seasonal melons, sprinkled on morning cereal or oatmeal, and enjoyed for dessert with whipped cream. But, blueberries do gain a different level of delicious-ness when cooked, so be sure to buy enough berries for many different dishes. I was intrigued to find this recipe for Blueberry Salsa and felt compelled to try it. The result: terrific! 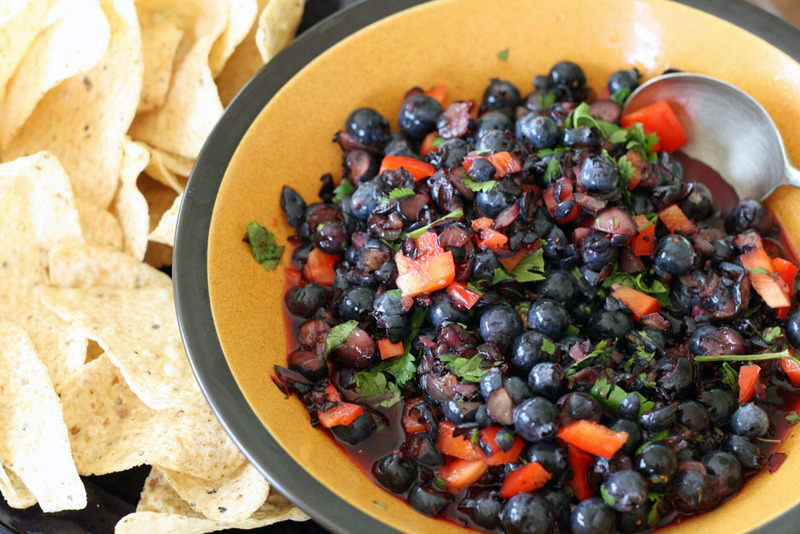 The sweetness of the blueberries, mixed with cilantro, lemon juice and red peppers, melded nicely with the salty tortilla chips. Make Dressing: combine lemon juice, vinegar, salt, pepper, and garlic in a medium bowl. Whisking constantly, add the oils one at a time in a steady stream. Remove garlic and serve (or store refrigerated up to 1 week). 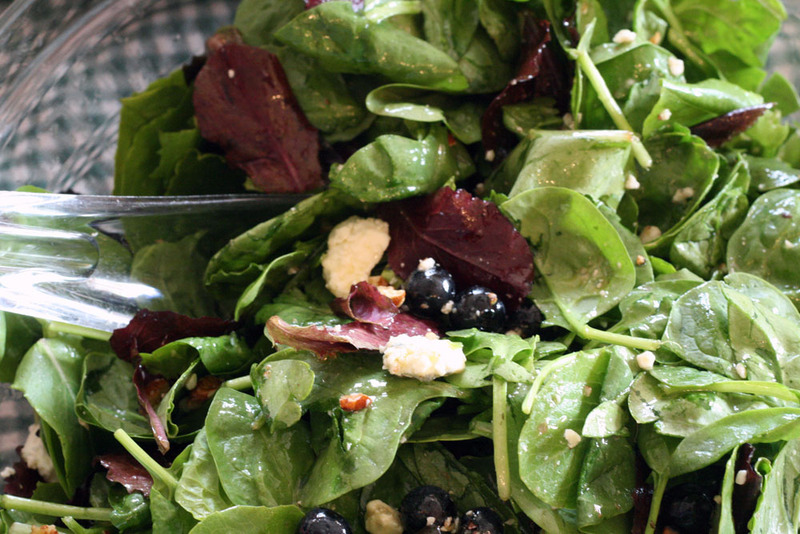 Make salad: toss together the greens and blueberries. Just before serving add the pecans and blue cheese. Toss with dressing and serve. These amounts feed 8-12 but can easily be halved. Blueberry Salsa sounds weird but perhaps wonderful??!!! Haha I think it's good to experiment and try strange recipes.. but only sometimes!! Most of the time it's better to use tried-and-true recipes that you KNOW works!! :PP But thanks anyway for the fantastic new ideas.